There are three recognized starting points for yacht charter Philippines sailing vacations: Puerto Galera, Subic Bay and Boracay. If you are not quite ready for the Philippines then you may be interested in our partner Tropicalboat Luxury Yacht Charters & Rentals for Caribbean and Bahamas yacht charter or perhaps Florida and Miami charter - they book luxury sailing and motor yachts worldwide. Puerto Galera yacht charter places you at the perfect entry point to some of the best cruising destinations and is one of the best places to start a sailing vacation. On the other hand Subic Bay is easier to get to from the two major international airports in the North (Manila NAIA and Clark DMIA) and only adds one day to most the cruising routes. Choose Boracay yacht charter if you only have limited time for your sailing vacation. Whether you are interested to charter a traditional sailing yacht, a cruising catamaran or a power boat, you can find it here or if you have a special charter in mind contact Puerto Galera Yacht Club with your specific Philippines charter requirements. If you have a yacht and want to charter it then this Yacht Charter Philippines page is the best place promote your yacht for charter or for hire in the Philippines. One point to note is that bareboat yacht charter in the Philippines is not so common because of certain regulations that affect insurance premiums. However, once you have chartered a yacht around the Philippines we are certain you will find that the little extra paid to the insurance companies for bareboat yacht charter will be well worth it for the experience of visiting the World's most beautiful of cruising destinations. 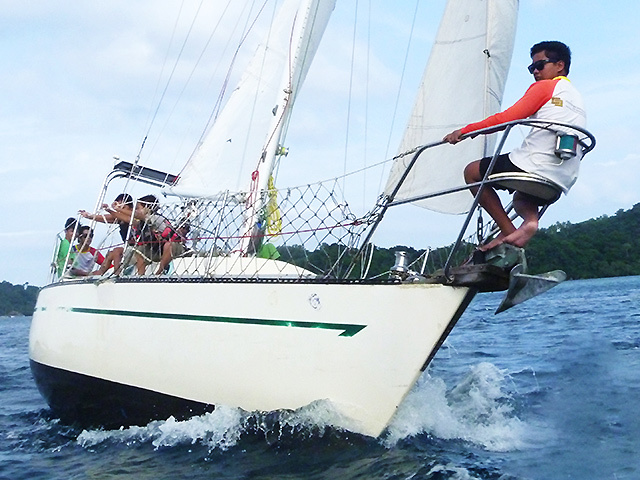 Go day sailing around Puerto Galera on the yacht club's own 30-foot sailing yacht. Explore the beaches and coves or just cruise across the Verde Island Passage, imbibing Mother Nature's gifts and maybe playing with the resident pods of dolphins. 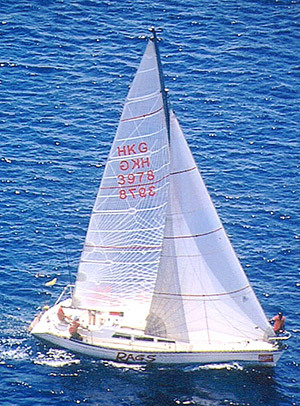 If you want to learn to sail a yacht then rent this yacht with an instructor - the best choice sailing course for beginners. Charter the sailing yacht "Rags" and include waterfront villas for rent in Puerto Galera, Philippines. Tranquil, spacious, luxury two-bedroom or six-bedroom waterfront villas set in their own grounds, overlooking Dalaruan Bay, Puerto Galera. Full-time housekeeper. Good for 4 - 14 people. Dinghy and Hobie 16 available. The perfect Philippine holiday getaway. Farr 1104 (36 foot) sailing yacht equipped for day-sailing yacht charter and cruising around Puerto Galera, island hopping and elsewhere in the Philippines; boatman with local cruising knowledge available at no extra charge. Or, combined luxury waterfront villas and sailing yacht charter package for your next Philippine holiday, from as little as US$250 per day. Charter a cruising catamaran to Boracay from Laiya, Batangas. Choice of 5 day / 4 night island hopping adventure to Boracay or a 7 day / 6 nights extended island hopping adventure, aboard S/Y Naya. 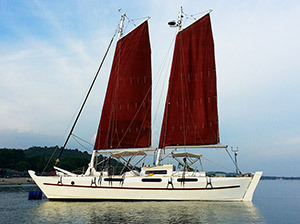 Naya is a 46 foot Tiki Wharram catamaran (Tiki 46) built in 2006, ordinarily moored at Laiya, Batangas. She has three, private double berths plus an extra double berth beside the galley. For day charters, deck space can accommodate as many as 18 people. A dive compressor and scuba tanks can be added to her inventory for those who want to explore beneath the waves along the way to anywhere. 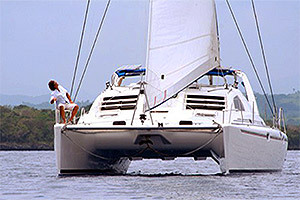 For more information about Yacht Charters to Boracay or anywhere else, aboard the catamaran Naya, visit www.nayasailing.com. "Ashanty" is a well maintained and fully equipped Leopard 38 cruising catamaran that can accommodate up to six people in three double berths. With kayak, snorkeling equipment and a tender she offers a superb mobile, water fun venue with which to explore the Philippine Islands. Most charters will start from Busuanga / Coron but you could alternatively arrange to join her starting in Boracay or El Nido. Her owner skipper has more that 40,000 sea-miles of experience and can provide much insight into sailing and cruising around islands of the Pacific. Subic Bay yacht charter: charter a motor yacht for a day cruise, sunset cruise, island hopping or sail overnight to the outer islands near Subic Bay, Philippines. 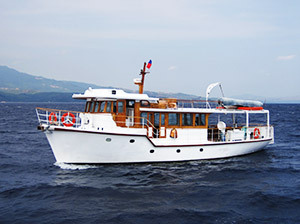 Relax in the spacious luxury aboard the beautifully restored, historic motor yacht Isla. Formerly the pride of fleet of the famous Hong Kong trading house of Jardine, the motor yacht Isla was used to entertain business tycoons and Royalty, cruising Hong Kong harbour, penning multi-million dollar deals and negotiating favourable trade agreements. Today she is in the Philippines, based in Subic Bay, and for as little as US$600 for four hours (inclusive of full crew and fuel), you and your friends or colleagues can charter the motor yacht Isla and enjoy the spectacular sights of Subic Bay while imbibing the luxury, and wining & dining in the splendor of a majestic and romantic era, as Royalty once were. The motor yacht Isla can accommodate up to ten passengers in luxury private cabins for overnight yacht charter to the islands near Subic Bay or, up to 30 passengers for sunset cruise and day sailing charter around Subic Bay itself. The motor yacht Isla meets all Philippine Coast Guard offshore requirements for safety. For more information about how to cruise like Royalty in the Philippines with a motor yacht charter in Subic Bay, please contact: tel +63 918 939-0615 or, click here to email your yacht rental requirements or, to charter motor yacht Isla. If you would like to advertise the services of your yacht charter Philippines enterprise or you are looking for more information about sailing vacations in the Philippines, email the webmaster(at)pgyc(dot)org today. This yacht charter Philippines page is an information-only service from the Puerto Galera Yacht Club. However, you can rent dinghies or a Hobie direct from the club.